This capital of the Hittite Empire presents its 2300 years old ruins that will fascinate the visitors and intrigue the history buffs. Located 200 kilometres away from Ankara, these ruins are a must visit on your trip to the city. There are very few standing structure left but the layout that stands even today will enthral you. The Hittites have a mention in the Holy Bible as conquerors of Babylon and challengers of Egyptian Pharaohs. Hattusha was their centre of power and hence has a majestic history surrounding it. 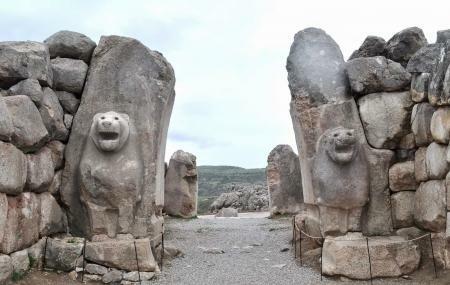 The site also includes temples to the deities of Hittites like the Storm god. When visiting Hattusha, do not miss out observing the Yazilikaya which is an inscribed rock and is a few kilometres away from the main ruins. Alacahoyuk is also an important Hittite city and is 36 kilometres away from Bogazkale which is also worth a visit if interested in history. To understand the history of the ruins, buy a guide book or hire a guide. Lots of walking is involved so wear comfortable shoes. The ticket price includes entry to Hattusha and Yazilikaya. Bus to Sungurlu, then a minibus or taxi to Bogazkale. How popular is Hattusha Or Bogazkale? People normally club together Kocatepe Mosque and Panora Alisveris Ve Yasam Merkezi while planning their visit to Hattusha Or Bogazkale. People also prefer to start their day with Hattusha Or Bogazkale.